How to go about upgrading the different components of your computer, from the power supply to the motherboard and beyond. You can completely update that old, tired computer with a substantial savings. *Step by step instructions on what can be repaired and what has to be replaced and how to do the task. From the hard drive to memory to the power supply. *What to look for when replacing a component. *Step by step instructions on hardware replacement, and how to troubleshoot hardware errors. *A list of troubleshooting techniques and individual component troubleshooting. *Step by step instructions on what to look for when the computer has a problem. * A glossary of terms and what they mean to the everyday user/business person. From the basic computer to the advanced terms used everyday by ‘techs’. *Tips and instructions on how to make your computer faster than the day it was unpacked. *Laptops require a different approach to repair than desktops because all the components are packed into a very small, tight space. 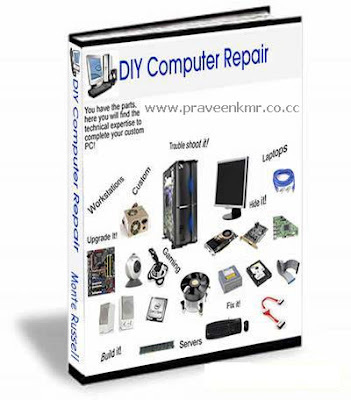 This portion of the book is all about laptop repair and care to keep it functional years after the warranty has ran out. Of course the rest of the book still applies, computers are computers after all, but this section addresses the specialized needs of notebooks and laptops. * A special section that will assist you in how to decide where to back up your data, when to back up your data, and how often to back up your data. *Do you have anti-virus protection? This section explains how viruses got started and what you need to do to protect one of your most valuable resources – YOUR DATA. * All big corporations hire departments full of ‘techs’ and ‘programmers’ to protect their data and prepare for a disaster. The last thing they want is to lose business because their data is gone. You need to know how to protect your data and how to make an image of each of your hard drives. *Over thirty different subjects covered in the how to section from creating a backup to why you need to have the Windows Firewall service running when you are on the road. *Hiding Your Computer From Hackers / Thieves / Criminals! *A properly configured router will block identity-stealing viruses and trojans written by people you really don’t want knowing your name. Of course, we give step by step instructions. *Over 350 pages full of tech know how, over 100 illustrations. *No more searching the internet for hours on end to find an answer to your problem, you’ll have it at your fingertips.